It offers hip and trendy ready-to-wear apparel, modern home lines and house ware, fashionable footwear and unique fashion accessories at unbelievably low prices. 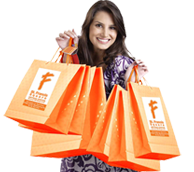 St. Francis Square Department Store's objective is to match fashionable and branded merchandise at bargain prices and excellent customer service. In its desire to cater to its customers' needs, St. Francis Square Department Store, now offers a wider selection of merchandise. These fashionable yet reasonably-priced goods come from the major shopping capitals and were chosen with the customer's tastes in mind. The department store is a one-stop-shop as it has also a Snacks Section as well as the School and Office Supplies Section. Every merchandise offered by the St. Francis Square Department Store combines affordability and quality.